May 11 1909 -- 'Pitchfork' Ben Tillman was a sub-human scumbag of a human being who served as South Carolina's governor and then senator for almost three decades, and might well have served even longer if he had not finally the common decency to drop dead. President Theodore Roosevelt, to his everlasting credit, snubbed him, earning a particularly malignant enemy. 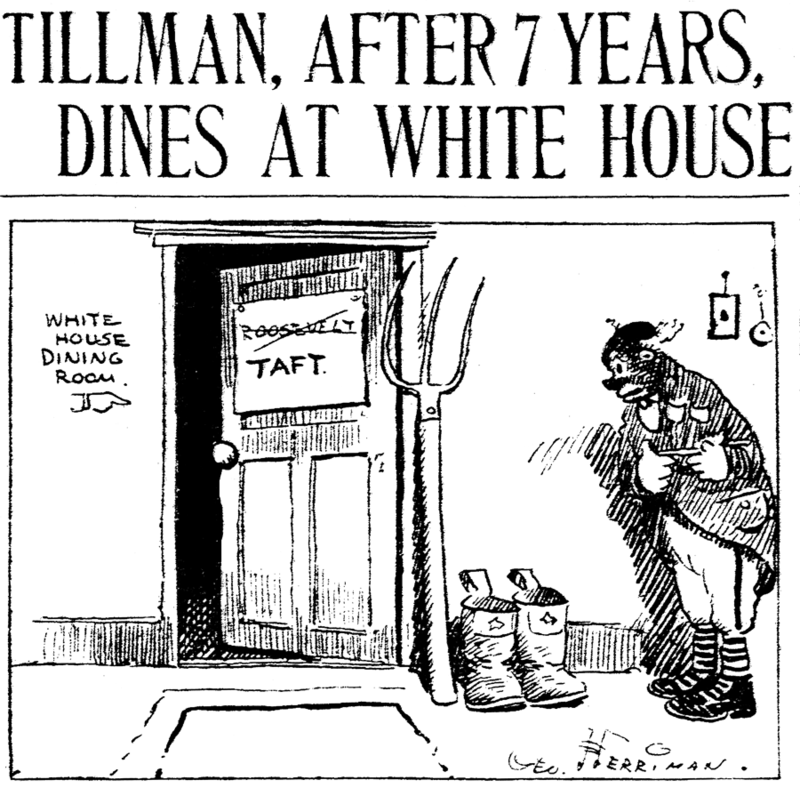 When Roosevelt entertained Booker T. Washington at the White House, an apoplectic Tillman made a statement so disgusting it is surely the stuff of white supremacist wet dreams. When Roosevelt vacated the White House, his successor Taft, billed as a worthy successor in grave error, soon invited this putrid excrescence for dinner, prompting the above Herriman cartoon. As with all my cards in which Walter Wellman asserts his copyright, there is no maker credited. This one, however, does tell us it is in "Series L" .... good to know. 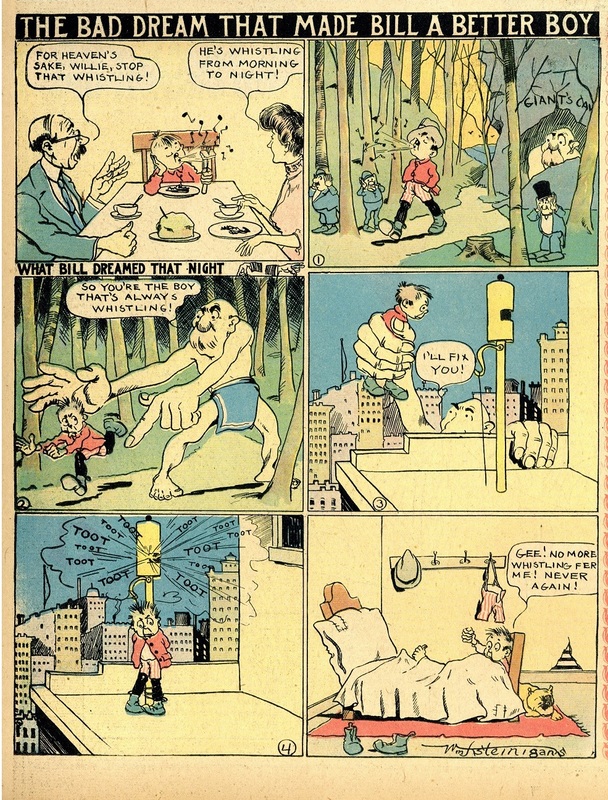 Some cartoonists really liked these rhyming single word per panel comic strips, Al Posen practically made a career of them. I don't know if the form has a name. Since they are like really really short haikus, maybe haikups might be appropriate? That sort-of looks like a "4," not an "L," if you ask me. And a four makes a bit more sense than a letter, but what do I know? This paragraph is from Terry Ramsaye’s A Million and One Nights, the most comprehensive and perhaps the most interesting history of the cinema art yet published. Ramsaye’s observations were made at first hand. He was part of the picture. So, even though some of the details lack accuracy, the general outline is at least illuminating. “In the normal course of events,” Ramsaye continues, “on days and at hours when nothing especially happened, the Chicago Evening American went tripping out into Chicago’s Loop district at the rate of an edition about every forty-five minutes. Under the external pressure of vivid events or the internal pressure of even more vivid Koenigsberg inspirations, the American erupted editions fifteen or twenty minutes apart until relieved, and until the adjacent shores of Lake Michigan were knee deep in the lava, scoria:, ashes and hot mud of the current sensation. The normal schedule was seventeen editions a day, with a new whimsy, thrill or shudder roaring across the first page of each of them. This made it desirable for Koenigsberg to have or overtake an idea expressible in type of 480 point and upwards every few moments. There would be more fun in accepting than in correcting these Ramsaye and Keeley sketches. But it’s impossible to assume responsibility for seventeen regular editions of an afternoon daily. Nine were plenty. And it is, in a way, regrettable to disclaim tutelage from that incomparable juggler of journalism, Arthur Brisbane. My direct contacts with him did not come until several years later. 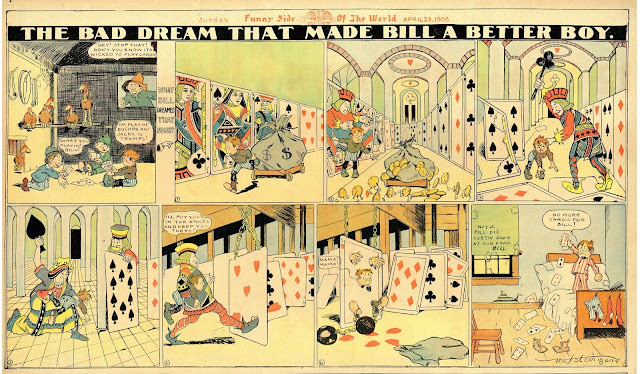 Then, they were mostly poker games, sometimes actually with playing-cards but in the main with newspaper features, which he usually dealt to me from stacked decks. His deftness in such dealings requires attention in later phases of this narrative. If there were any culpability in 480-point type, it is here confessed. When it was used, on occasion, it filled the top of the first page down to the fold. The size of the lettering was limited only by the area available for display on the sales stand. Larger space would have been occupied with larger type. All news is relative in importance. It was my practice to assess the proportions of a story in the proportions of the heading. This was scarcely a novelty. It was an outgrowth of conditions that gave emphasis a master key to reader interest. The use of “scare” or big type was buttressed with a theory by which questioning of good taste was subordinated to an approval of conscience. The primary function of a startling headline was to arrest attention. An analogy was found in the Salvation Army’s device to attract street crowds. The gaiety of the Salvationist band’s music—tunes often more befitting a sailors’ revel than a prayer meeting—was an ethical companion to the boldness of the daily’s head lettering. The evangelist musicians were sent forth to halt vagrant souls. The newspaper headline was set out to halt vagrant minds. The portion of spiritual solace the sinners ultimately received was painfully small compared with the amount of mental pabulum the readers eventually absorbed. With such philosophy mountains may be moved, though the critics remain! At least, it was a good talking point at meetings of women’s clubs. 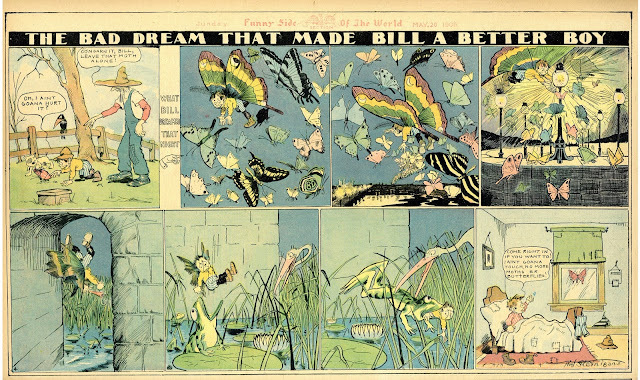 It is true that during the greater part of five years, 1903-1907, the Chicago Evening American poured out a ceaseless torrent of sensational stories. Diligent research has failed to reveal an equal record elsewhere. But Terry Ramsaye’s more or less flattering appraisal of the cause must be revised. Providence must bear the onus. It had assigned to the Chicago of that period a surplusage of news-making ingredients. The city was the hub of highways and secret trails leading from the penitentiaries of five adjacent states. It was the center of operations of ex-convicts numerous enough to crowd the largest penal institution extant. Homicide was commercial. Human life lay on the bargain counter. Analysis of the testimony in fifty murder cases showed an average price of $3.65. Sordid crime was only one phase of rampant violence. Chicago, at the opening of the century, was glutted with the raw elements of social turbulence. Vast throngs of unassimilated immigrants were milling around in alien misunderstanding of each other and of their new environment. Their clannishness aggravated the frictions. They congregated by nationalities into adjoining neighborhoods. Some of these sections became more populous than the newcomers’ homeland metropolises. The concentration of transplanted settlements, with their concomitant traditions, prejudices and jealousies, introduced few tranquilizing effects. The explosive content of this sprawling babel was always nearest the detonating point in the stockyards region. There, worked the most heterogeneous mass of labor ever assembled since the Caesars impressed toilers from each dominion of a ravaged world. The “Windy City” then was largely a conglomeration of urban crudities. Refinements of a later period were delayed by a dearth of civic pride. Filthy feathers are not fit to plume, and Chicago’s wings were putrid. Scantiness of communal spirit favored the spread of vice and corruption. Opportunist sanctions of a “go-getter” generation facilitated this expansion. Perhaps the municipal crest was misunderstood. It consists of two words, “I Will!” Many a Chicagoan interpreted this too loosely. From the maelstrom of happenings that swept out of this vortex, less ingenuity than perception was required to evolve striking headlines. The real task was to keep the boat steady. Capsizing was a constant hazard. Several of my predecessors had gone overboard on stories they misjudged. Each of these had selected for the main heading of an edition an item that dwindled into insignificance before the issue reached the news stands. That is an inexcusable blunder. Sometimes it demonstrates an egregious flaw in otherwise gifted journalists—a deficient sense of relative news values. In some cases it reflects a misplaced enthusiasm. In most cases on the Chicago American the responsible editor passed the dunce cap to the city editor. He blamed the chief of the local staff for misleading dope. My assumption of the city desk marked its twenty-seventh turn-over in thirty-seven months. That procession of city editors included several men who attained journalistic distinction elsewhere. 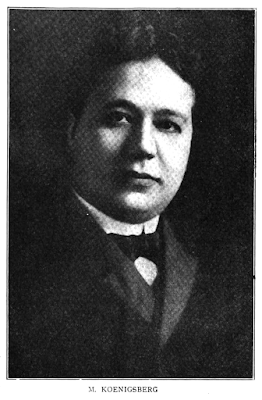 Edgar G. Sisson, afterward editor of Cosmopolitan Magazine, took three “whirls” at the job. Each time he quit to seek the ministrations of a nerve specialist. A bit of pungent satire tinged his third resignation. He described his departure as “an escape from a madhouse.” Sisson’s description clung to the Chicago American office for a number of years. It had a double effect. It simultaneously raised levels of compensation and standards of competence. Capable men on other dailies declined to join the Hearst paper except at salaries “that would absorb some of the strain.” And they wouldn’t make the change unless they felt sure they could make the grade. The result was a staff of superlative ability. A job “in the Madison Street madhouse” became a badge of professional merit. By analogic processes, this came to apply io the Hearst organization from coast to coast. Walter L. Hackett relinquished the city editorship of the American to me. It was a simple ceremony. He brought a pair of sesquipedalian shoes down from a point three feet above his head, unwrapped his amazingly long legs from the desk that had served him more as a day-bed than a work-bench and, getting slowly to his feet, yawned prodigiously. Walter was a one-man Greenwich Village. With him, a veneer of artistry outweighed a weekly wage. He preferred play-writing to prosperity. He thanked me cordially for relieving him. His incumbency, as head of the local force, was one of the unsolved enigmas of the Hearst domain. It was also one of the principal reasons for Foster Coates’s presence in Chicago, with the result of my induction into the service. Success was to be measured with only one yardstick—circulation. Its attainment seemed to me to depend largely on outstripping competitors in the collection of news. We must get more and we must get it more promptly. Any city editor could use the agencies and implements that were handed to him. To achieve notable results an executive should add tools of his own devising. My first step was to organize unused resources. A veritable dragnet for fresh intelligence was set up. The coroner had eleven deputies. Nine of them were persuaded to act as confidential members of the American staff. They formed one of the most effective of our auxiliary corps. Time and again we were enabled to give the police department its first notice of a tragic event. Through the telephone switchboards of leading hotels, hospitals and institutional centers ran the threads of countless interchanges from which any number of stories might be plucked daily. A score of the supervisors or chief operators were enlisted among our tipsters. The Auditorium Annex, alone, over a long period furnished a weekly average of more than one tophead scoop. From a web woven around unofficial channels came much more exclusive material than was yielded by all our routine sources combined. Thus was installed the most efficient machine for the gathering of local news that has ever fallen within the range of my observation. This was supplemented with a journalistic innovation. Ordinarily, trained reporters were employed on the assumption of competence to cover any assignment that arose. But reportorial skill fell into two main classifications. One was fact-finding. The other was fact-telling. Rare was the individual who found his forte in either field alike. Temperament was the dividing line. The urge for discovery seldom mated with the passion for portrayal. One delved among the roots of the tree; the other entwined the foliage. My plan first separated and then coordinated these talents. The staff was divided between the diggers and the spinners of tales. The “leggers” or “leg men” were so called because their legs kept them close to the scenes of action. They were not required to visit the office. They telephoned their stories to the “rewrite men.” The latter appellation was partly a misnomer. Originally, it labeled editorial workers who revamped copy submitted by others. On the Chicago American it indicated carefully chosen writers who put into manuscript first-hand facts spoken over the wire by reporters “on the spot.” They wrote most of the local news that we published. The novelty was not in the handling of items by phone. It was in the different form of staff organization —the segregation of personnel “by foot and finger standards” as one wag phrased it. To an incalculable saving of time was added a distinctive uniformity of product. It was the acme of institutional reporting. That was before the vogue of signed stories. The reporter was not an entity apart from his newspaper. He devoted no concern to a personal following. He wrote, not for a section, but for all the readers of the publication—-for their easy digestion without the need for saltcellars, filters or sieves. A coherent authority— a composite personality—dominated the news columns. They were not yet under the saddle of the columnist. The critic had not yet routed the publisher. Poe’s raven had not yet found its counterpart in a sanctum bugaboo. The editor still believed in himself. “Easy to read” was yet one of his cardinal commandments. He had not yet decided that it was worse to be accused of an inclination toward stereotyped forms than to be caught using a kaleidoscope. The first news coup credited to my city editorship of the Chicago American was clinched by a cub. But what a cub! Jack Lait was just twenty. Yet he proved a courage and resourcefulness matched by few veterans. The stunt was a precursor of his brilliant career as war correspondent, dramatist, short story writer, editor and for twenty years author of more printed words than were written during the period by any contemporary. Lait sent to prison John J. Brennan, Chicago’s most powerful and most notorious ward leader. The performance ran the gamut of a cinema thriller. 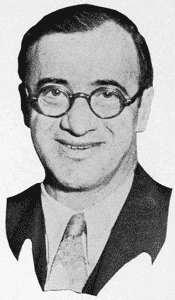 The Chicago American was intent on preventing the reelection of Judge Elbridge J. Hanecy. He had been unkind enough to rule that an editorial criticizing one of his decisions was in contempt of court. The freedom of the press was pleaded in defense. The case was on appeal. One of the judge’s political strongholds was the Eighteenth Ward. There, Alderman Brennan maintained a vote hatchery of unsurpassed productivity. It excited the awe of even such statesmen as “Bathhouse” John Coughlin and “Hinky Dink” Kenna, aldermanic jewels of the First Ward. Droves of floaters had moved into the adjoining rookeries on “Bums’ Row.” Lait became one of them. He learned the fine points of voting early and often under the names of dead men, fictitious persons and absentees. There were thousands of these “ghost” electors. They were coached in accordance with bogus entries with which the registration lists had already been padded. Lait attended these rehearsals. He was soon “propositioned.” He accepted four names to vote in four different precincts beginning at 7:00 a.m. on election day. After each vote was cast, Lait received fifty cents. In between, he managed to reach me over the telephone. In the first three polling places, the money was paid by underlings. At the fourth, Brennan himself dealt with Lait. The boss stepped into the booth and marked a ballot for “Kansas City Slim’s” use. Then he walked with Jack to the box. On the way, Lait contrived to print his initials on the back of the sheet, unobserved by those around him. This was the evidence that convicted Brennan. His lawyers hurdled all the other testimony. Bill Stewart, a Chicago American reporter, swore that, waiting across the street, he saw Brennan hand the bribe to Lait. His statement was corroborated by an election board official who stood beside him and whose presence had been arranged at my request. None of this seemed to bear much weight. On Lait’s shoulders alone fell the vengeful storm whipped up by Brennan and his friends. Between the arrest and the conviction, Jack dodged bullets and billies. The American engaged Pinkerton men to guard him day and night. But his work as a reporter was not interrupted. With Brennan partizans dogging him and Pinkerton men trailing alongside, he led a bizarre procession wherever he went. The close of the sensational trial brought me mixed relief and astonishment. The betting had favored Brennan’s acquittal. He served a year in the Bridewell, or House of Correction, dying shortly after his release. Judge Hanecy was defeated. That became a minor incident beside the dethronement of Boss Brennan. The cub reporter had “stolen the play” of his newspaper. 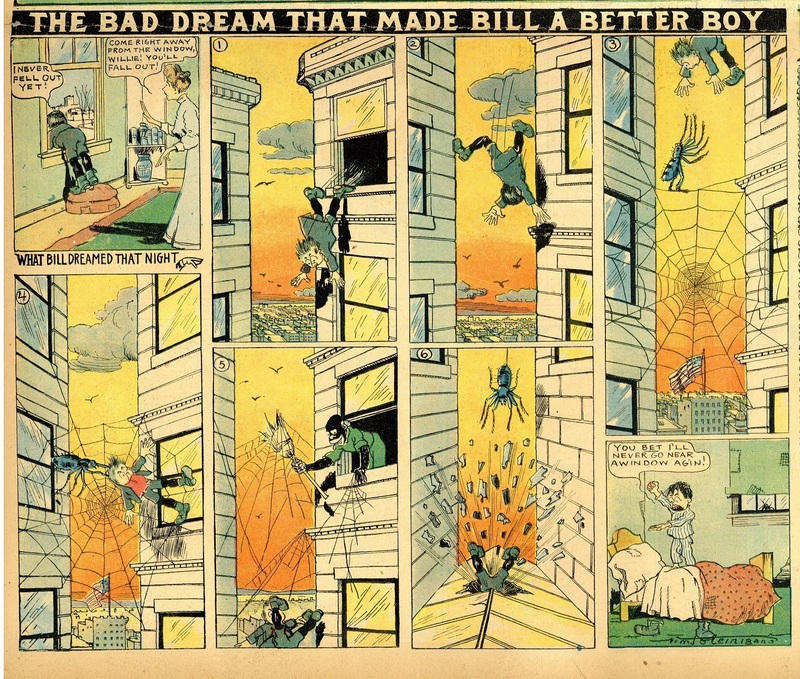 Last week I did a post on the New York World strip The Bad Dream that Made Bill a Better Boy. According to my book, in which I quote from Ken Barker's World index, the first installment of the series was penned by Gene Carr, but then William Steinigans took over for the rest of the series. As you can see, the microfilm has turned most of the last panel of the strip into dark mud. No signature can be seen. 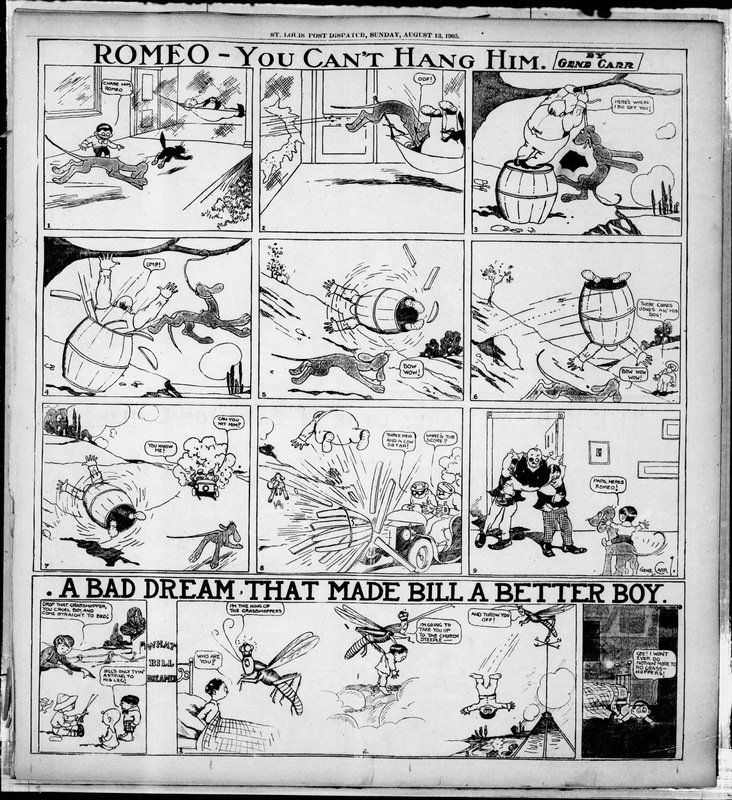 So, I thought, Barker was fooled into thinking that the strip was by Carr because it sort of looked like an adjunct to his almost-full page Romeo strip. Is the art by Carr, I wondered? It does have Carr's signature big flat faces with large circles for eyes. However, Steinigans does sometimes draw those same types of faces, though he generally prefers 'dot-eyes'. Since some characters in the strip have dot-eyes, I felt my art ID as Steinigans was reasonable, especially considering the highly unusual circumstance that would have occurred if Carr had handed off the strip to Steinigans after a single installment. So it turns out that Barker had it right. Apparently the World microfilm he was working with afforded a slightly better view than did the Post-Dispatch digitized film, and far from being the fooled one, he hit the nail on the head, leaving the dunce cap perched quite squarely on my head. So I herewith offer my apologies to the late Ken Barker, and my heartfelt thanks to Pierre-Henry L'Enfant, who set me straight. L'Enfant also sent me the next several installments of Bad Dream and some gorgeous 1906 4-color examples, and I herewith offer you a look-see as well. Thanks Pierre-Henry!! When Barker made his list back in the 1970's, he was using a NY World microfile, so maybe he was right all along because the file was clearer to begin with. Just a thought. Henry “Hy” Mayer was born in Worms-on-Rhine, Germany, on July 18, 1868, according to passport applications and profiles in several books. 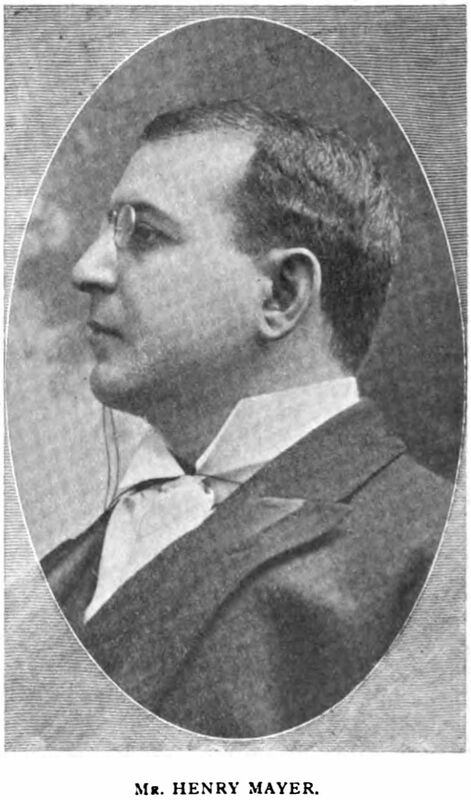 The American Jewish Year Book, Volume 6 (1904), said Mayer’s parents were Hermann Mayer, Sr., and Helene Loeb. Who’s Who in America (1908) said Mayer was educated “in England and Germany” where he graduated from the Gymnasium, Worms, in 1886. He “entered business life in England” and came to the U.S., through Mexico and Texas, in 1886. However, Who’s Who in New York City and State (1907) said Mayer “went to Mexico in 1885”. The Jewish Encyclopedia said “In 1885 he went to Mexico, and subsequently to Texas. There he discovered his ability to draw, and developed his talent without the aid of a teacher. Mayer next went to Cincinnati and thence to Chicago, where he began his career as caricaturist and illustrator.” Information at Ancestry.com said Mayer arrived in New York on August 31, 1885. He was aboard the Cunard steamship Servia from Liverpool, England. According to Mayer’s 1920 passport application, he resided in “El Paso, Chicago, Cincinnati & New York” and “was naturalized as a citizen of the U.S. before the Superior Court of Cook County at Chicago, Illinois, on the 30th day of August, 1890”. Mayer’s first passport was issued September 1, 1890. On the application, Chicago resident Mayer said he was an artist and journalist. Mayer picked up his passport in New York City. Mayer lived in Chicago when he received his a passport on August 14, 1893. 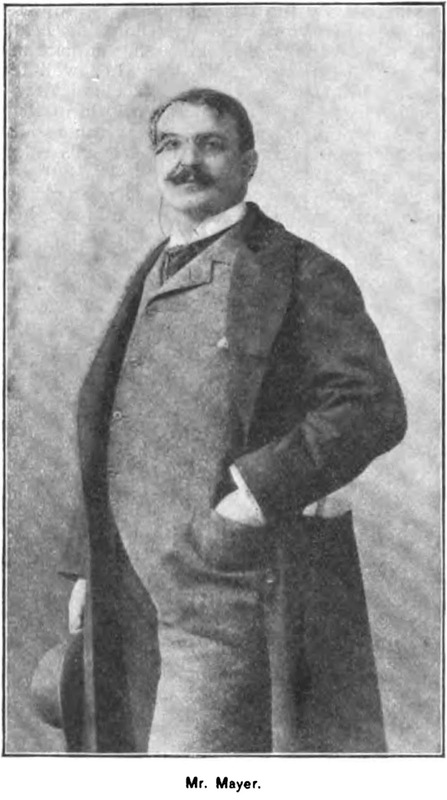 Who’s Who in America and Who’s Who in New York City and State said Mayer resided in New York City beginning in 1893. Mayer’s home in New York City was 53 Wast 59th Street when the illustrator obtained a passport on February 26, 1896. The Columbian (Bloomsburg, Pennsylvania), January 14, 1897, reported the upcoming debut of “The Sunday Press Jester” by the Philadelphia Press newspaper. Mayer produced a color cartoon for the front page. The New York Evening Telegram, April 7, 1897, reviewed Mayer’s gallery show. Mr. Henry Mayer is also, in a way, a student of Americanism. His drawings now on exhibition at Keppel’s gallery, in East Sixteenth street, seldom fail, whether consciously or unconsciously, to preserve the traces of at least one parent race in his most characteristically American skits. But Mr. Mayer is a humorist, a caricaturist sometimes, with a wonderful facility of ludicrous invention, and at times a feeling for character and a skill in its delineation that almost suggests Forain’s acrid ironies. At other times his humor has a Rabelaisian touch. The present exhibition of Mr. Mayer’s work covers a number of years and is made up chiefly of designs that have first made their appearance in the various comic weeklies. Several of them have been seen in the Evening Telegram. In the greater number of instances they seem to have lost nothing by reduction, but even one who has followed Mr. Mayer’s work through the humorous publications of the day can gain an increased regard for his attainments in his particular field by the massing of his work in a single gallery. The exhibition was also reviewed in the New York Sun. A month later, Mayer received a passport. The Manhattanite’s address was 55 West 59th Street. The Chicago Tribune, June 14, 1899, reported that Mayer, artist Albert B. Wenzell and another American were attacked the previous evening in Paris by a group of Nationalists. The trio refused to shout “Vive l’Armee” as demand by the Nationalists. Mayer was knocked to the ground by a walking stick. The Americans and a Nationalist were arrested. The Americans were released when they threatened to demand help from Ambassador Porter. Who’s Who in America said Mayer contributed illustrations to Fliegende Blaetter (Munich), Figaro Illustre, Le Rire (Paris), Black and White, Pick-Me-Up, Pall-Mall, Punch (London), Life, Judge and Truth, Harper’s, Century, Collier’s, Leslie’s, the New York Times, and New York Herald. 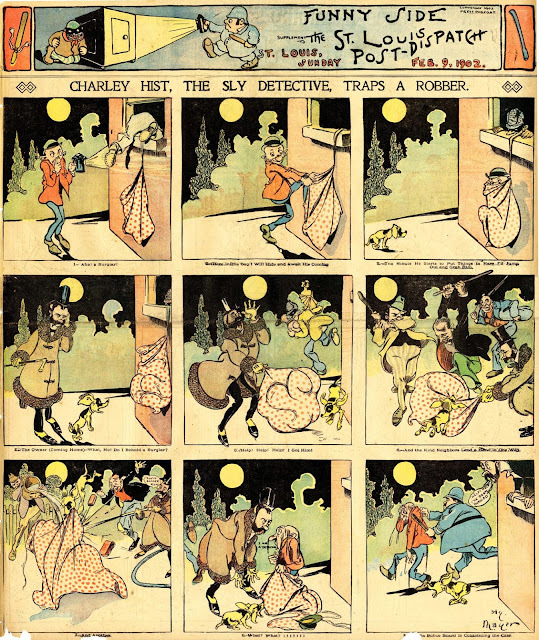 The Critic, October 1900, published five caricatures by Mayer. American Newspaper Comics (2012) said Mayer produced several comic series in the early 1900s. For the New York World, Mayer drew The Plunk Family, Brother and I and Sandman, and one Charley Hist the Detective. World Color Printing distributed Mayer’s Professor Presto, Master of Magic, Bobbie Binks, and Main Street. 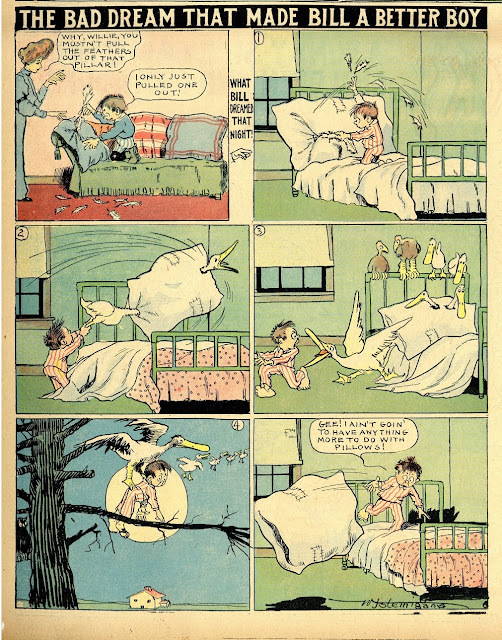 Mayer contributed two short series to the New York Herald: Zoological Kindergarten and Will O’ Dreams and the Sandman. The McClure Syndicate handled Mayer’s Adventures of a Japanese Doll. Mayer’s books include The Autobiography of a Monkey (1897), In Laughland (1899), Fantasies in Ha! Ha! (1900), A Trip to Toyland (1900), Adventures of a Japanese Doll (1901), and Alphabet of Little People (1901). Mayer’s work was examined in Brush and Pencil, June 1901, and The New Era, February 1904. The 1904 American Jewish Year Book listed Mayer’s address as 30 West 24th, New York. In the 1910 U.S. Federal Census, self-employed illustrator Mayer resided in Manhattan at 55 West 33rd Street. In 1913 Mayer played vaudeville and was on the first bill at the Palace Theatre. Mayer’s appreciation of Phil May appeared Munsey’s Magazine, January 1914. During World War I, Mayer sold Liberty Bonds. One of his animated cartoons was sent to overseas allies. A profile and photograph of Mayer was printed in the Great Falls Daily Tribune (Montana), August 29, 1920. Exhibitors Trade Review, February 25, 1922, reported the transfer of distribution rights to Mayer’s Travelaughs. World Biography, Volume 2 (1948) said Mayer married Alice McKenna in January 1924. On May 30, 1924, Mayer and his wife Alice returned from a trip to Europe. Mayer’s address on the passenger list was The Lambs, 130 West 44th Street, New York, New York. According to the 1930 census, Mayer was 55 years old when he married Alice. The following year Mayer, his wife and stepson John visited Europe. They departed Bremen, Germany and arrived in New York November 20, 1925. The same address was recorded for this trip and another in 1927. A 1928 passenger list said Mayer lived in South Norwalk, Connecticut at 300 Flax Hill Road which was the same address in the 1930 census. Passenger lists and the census listed Mayer’s stepson with the Mayer surname. The 1940 census recorded retired illustrator Mayer and his 45-year-old wife at the same location in South Norwalk. Mayer’s stepson was recorded as Jack McKenna, a laundry truck driver, who was married with one child and resided in Norwalk at a different address. Mayer passed away September 27, 1954, at his home in South Norwalk. His death was reported the following day in The New York Times. In the hands of accomplished cartoonist Hy Mayer Charley Hist the Detective, a pedestrian strip in which a would-be gumshoe gets the stuffing beat out of him, is actually pretty darn awesome. 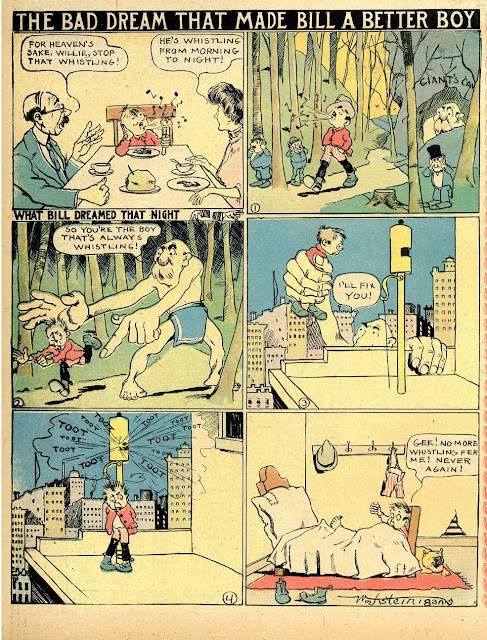 If you follow Stripper's Guide regularly, you are familiar with the fact that in early comic strips, comedic violence was a constant ingredient in the Sunday comics stew. Most of it couldn't bring a laugh to a hyena, but when Hy Mayer sets his hand to the genre, wow! How amazing that with the simple addition of great character design, effective body language, and dramatic staging, you can turn the typical dreck into something worthwhile. Charley Hist the Detective is no classic by any means, but at least it is worth the ink it took to print it. Compare that to a more typical 'funny violence' strip of the day, say Sunny Sam and Shy Sue. What a difference. 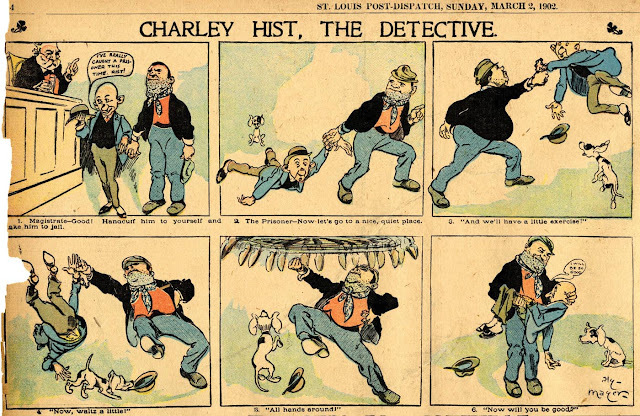 Charley Hist the Detective ran on February 9 and March 2 1902 in the Pulitzer paper St. Louis Post-Dispatch. Ken Barker's New York World index indicates that a third episode ran there, on March 9, unless it was a typo. Thanks to Cole Johnson who supplied the scans. I followed the link for Sunny Sam and got a Canadian real estate listing. Looks like a nice place, though. How's that for stealth marketing, eh? Nice house, just down the road from me.